Be the first to share your favorite memory, photo or story of Ione. This memorial page is dedicated for family, friends and future generations to celebrate the life of their loved one. 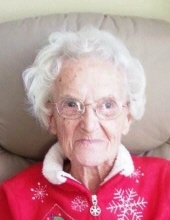 Ione Rose Andrew, 100, of Fond du Lac, passed away peacefully on Monday, January 28, 2019. She was born June 10, 1918 in the town of Friendship, a daughter to the late Anthony and Mary (Mand) Andrew. Ione enjoyed a 69-year career in the healthcare field, having been employed by various nursing homes in the Fond du Lac and Ripon areas, eventually retiring in June of 2003 at the age of 85. Ione was a devout Catholic and member of Presentation Parish, North Fond du Lac, and the church’s Altar Society. Ione’s faith was the center of her life and she has instilled in her loved ones the importance of faith, family and love. In her later years, Ione enjoyed spending time with her family, including all the family pets (Abby). She never met a dog that she didn’t love and they all loved her just as much. She also enjoyed watching game shows and playing bingo. She will forever be remembered by her family for her big heart, strong faith and infectious giggle. Survivors include many nieces, nephews and friends. Nephews Dennis (Mary Jo) Andrew, Ed (Patricia) Andrew, Don (Janice) Andrew, nieces Mary Andrew, Carol (Dan) Barton, Judy (Brett) Crabtree, Kathy (Mike) Montey, and Barbara (Jerry) Ward. Ione also had some extra-special great nieces and nephews with whom she was very close. She was preceded in death by her parents, three brothers, Edgar (Rose) Andrew, Alvin (Marie) Andrew, Tony (Shirley) Andrew, two sisters, Della Andrew and Lou (Jerry) Duffrin, nephew Richard Andrew, and niece Rosie Dooley. The family wishes to extend a special thank you to the staff at Crossroads Care Center and to Agnesian Hospice Hope for their loving care of Ione in her final days. Ione’s family will receive relatives and friends on Monday, February 4, 2019 from 10:00am to 11:00am prior to a Mass of Christian Burial which will be held at 11:00am at Presentation Parish, 701 Michigan Ave. North Fond du Lac. Father Fabian Rodas will officiate. Burial will take place in Calvary Cemetery, Fond du Lac. Memorials in Ione’s name may be directed to Presentation Parish to be used for masses in her honor. Online condolences can be shared at www.zacherlfuneralhome.com. "Email Address" would like to share the life celebration of Ione R. Andrew. Click on the "link" to go to share a favorite memory or leave a condolence message for the family.